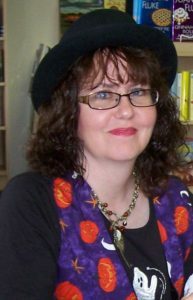 I recently interviewed Kyrie Carter, librarian by day and daring ghost hunter by night. She’s the protagonist of Leta Hawk’s Supernatural Sleuth series. Leta Hawk had her first encounter with a ghost at four years of age. Since then, she has been fascinated with ghoulies and ghosties and all things that go bump in the night, and now she writes about them. She lives vicariously as a ghost-chasing mystery solver through her Kyrie Carter: Supernatural Sleuth series, which includes The Newbie, School Spirits, and The Witch of Willow Lake. When Leta isn’t penning spooky stories, she can be found rounding up dust bunnies, or tackling Mt. Dishmore and Laundrypile Peak in her Central Pennsylvania home, which she shares with her husband Mike, sons Wesley and Wayde, and black lab Raven (but no ghosts). My name is Kyrie Carter. I guess you could say I’m a children’s librarian by day and an amateur ghost hunter by night, but that’s simplifying things a bit. The children’s librarian part is pretty straightforward, but the ghost hunter part is a bit complicated. I’m just coming to terms with the fact that I am an empath, and now it seems I am also a bit of a hedge witch. What kind of music do you like? Who’s your favorite musician/band? What’s your favorite song? I like a little bit of everything, I suppose, but my favorite musician is Barry Manilow. My ringtone is set to “Copacabana” (or it was until my boyfriend changed it to suit his taste—what a goof! ), so I guess you could say that’s my favorite. Hmm, that’s a tough one. Favorite dessert is easy—cherry cheesecake. But I will say I’m a sucker for a ham and cheese cosmo from Raymond’s Deli. I’m not much into calling someone my “hero,” but there are people I’ve admired for one reason or another. My dad because of his strength and convictions—even though I didn’t always agree with him. My Aunt Julia because she’s so caring yet can also keep everyone in line. And Gabe Petery, a celebrity ghost hunter who helped show me the ropes with paranormal investigation. Some people would say I’ve already got a knack for being invisible. I *was* voted Most Likely to Blend into the Walls in high school. If you had a pet, what would it be? Well, actually, I’ve just kind of inherited a demon cat from my neighbor who passed away. His (well-earned) name is Lucifer, and with him in the house, I never have to worry about an intruder…well, at least not a flesh and blood intruder. Where would you take your honey for a date? We’re both kind of homebodies and don’t like anyplace crowded. I’d love to take Spook out on the Susquehanna River, and maybe float over to one of the islands in the middle for a picnic, then stay there until it’s dark enough to stargaze. What movies do you like? Who do you take along? What do you get from the concession stand? Well, if I were going myself or with a girlfriend, I’d probably opt for a romantic comedy or a Disney movie. If I’d take Spook, he’d want to see something more action/adventure, or even horror. I’m not big on popcorn, so I’d probably get nachos or Junior Mints. My perfect day is probably sometime in mid-October, when the morning is crisp and the afternoon is just cool enough for a sweater or hoodie and boots. I’d like to spend part of the day hitting craft fairs and farmers’ markets, sampling all the goodies like apple dumplings, pumpkin whoopee pies, and hot cider. Then in the afternoon, I’d go for a hike in the woods where I can enjoy the leaves. After supper, I’d go to a flashlight corn maze—not one of those haunted ones where people with chainsaws jump out at you, just a corn maze. I’d end the day sitting outside with a fire in the firepit, roasting marshmallows and drinking hot cocoa. “Sounds good.” I pulled my hood up and stepped off the porch into the snow. The footprints we’d left when we first arrived had all but vanished, completely buried in new snow. I picked my way along the front walk, trying to avoid the spot where I’d stumbled on the tree root. As I turned the corner of the house, I ducked my head against an icy blast of wind. Reaching the vehicle, I looked up to grab the door handle and came face to face with a cloaked figure. I cried out in surprise and jumped back as I locked eyes with a short, heavyset Native American woman with long, gray-streaked hair done up in a single plait. Her charcoal-hued eyes glistened with recognition as she regarded me. “Helen, what are you doing here?” Jamison had appeared next to me and was glaring at the unexpected visitor. I mentally added the task to my list, but something told me that neither door locks nor deadbolts would keep out the strange woman who seemed able to appear and disappear at will. Please fill in the form below to receive Andrea Murray’s newsletter. You can stop receiving this newsletter by clicking the unsubscribe link in the footer of any email you receive from Andrea Murray or by contacting Andrea Murray at vividnovels@gmail.com. Andrea Murray uses TinyLetter for her newsletter. Any information you provide on this form will be stored by TinyLetter. Enter your email address to sign up now. Get the News from Dragon Moon Press!